I don’t think I have a favourite season. When I was a kid, we did seem to have four seasons, whereas now it seems that Winter starts early and ends late and Summer might appear, but then again it might not! Growing up in Surrey we had “proper” winters; cold, ice and snow. Now living in Devon, within a few minutes walk of the sea we rarely get snow, but true to form, when it snows the County grinds to a halt. One of my memories that always makes me smile when I think of winter. I was about 18 or so. We had had a real dump of snow during the afternoon on this particular Sunday. My closest friend phoned and said did I fancy a walk? It was cold, snowing and dark, but of course I said yes and wrapped up well. We met half way between our homes, under the clock in Guildford High Street, the only road that was still cobbled from an earlier time when horses were used as transport. We linked arms and set off for a stroll, looking in the shop windows, seeing the Christmas display and all the festivities. There was a crispness in the air, with a silence that just seemed absolutely right. We ventured into a local pub, a favourite of our year from school. The Kings Head had a lovely coal fire and we managed to get a table near the fire and warm up. We then parted, my friend to walk home up the hill and me in the opposite direction. Whenever I think of snow I think of that evening, when we simply met for a walk in the snow and a warm by a coal fire. 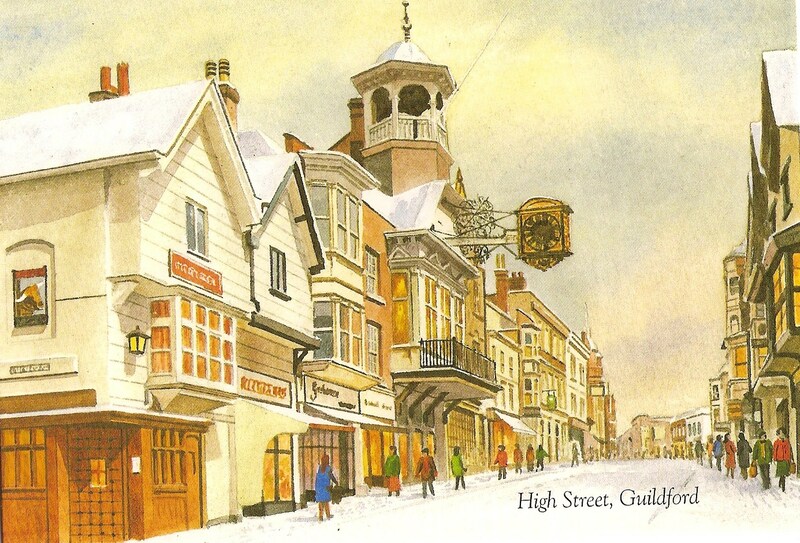 This picture here is from my Guildford and District postcard collection. It shows not only the Clock we always met under, but on the corner with the lantern outside is the Kings Head. The road that ran parallel to the High Street was North Street. In earlier times it had the rather amusing name of lower backside! Halfway down North Street was a bakers called Ayres. They had a slight slope into the shop, nothing particularly dreadful, as long as it wasn’t wet. When it was wet it was a death trap and many time I would slip and slide, grabbing hold of anything from landing on the pavement with a thud. It was a Saturday I think and I was in town with my Mum. We went into Ayres because in the window I had spotted some ginger cake squares which were simply delicious. I was served and left the shop. Eager to get home to a cup of tea and a slice of ginger cake. I waked half way down the street to the crossing when a lady called to me and said I was being called and pointed. I looked back, to see Mum stuck on the small wet and rather precarious slope terrified to move. I retraced my steps to rescue her but what Mum found so amusing was that I had merrily walked down the street talking to her, but actually I was talking to myself. I must have looked quite a sight, chattering away like a lunatic! Spring to me means, lambs, daffodils and Easter. I am rather partial to chocolate, and always as a child received several Easter eggs. One of which I know I must have eaten back in the Spring of 1973. 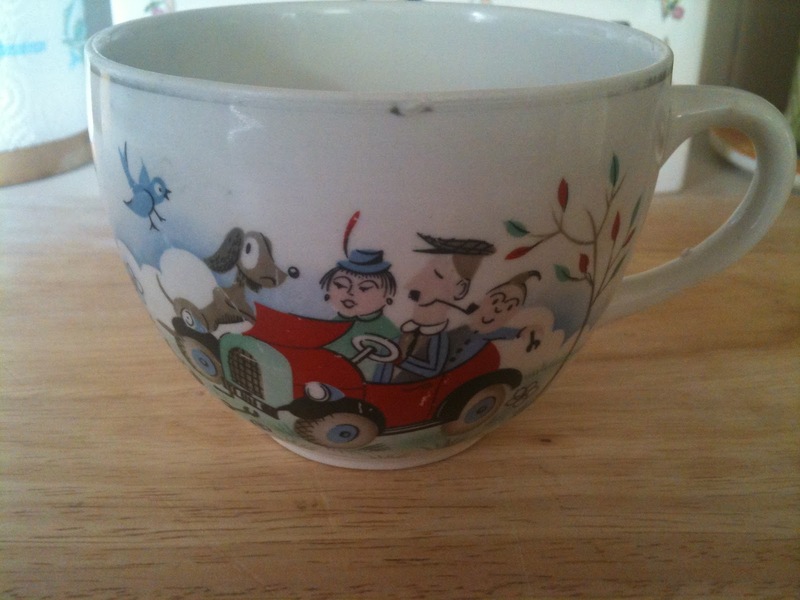 The Easter egg were often sold with an egg cup or mug. 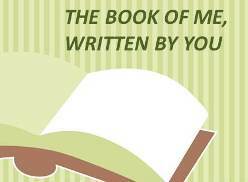 I recall sitting with my Grandfather, snuggled up on the bed with him, whilst we consumed the chocolate and he read to me. He played the game of hiding the chocolate each time my Grandmother came into the room. I am sure she knew all the time, but simply continued with the joke of it. As soon as she left the room the chocolate would reappear and we would carry on eating, reading and listening. I recall my Grandfather used this mug as his shaving mug when he was ill and would still shave. The mug has survived and now hangs from a hook in the ceiling beam of my kitchen breakfast room where I see it every morning. Although I do not particularly like hot days – anything over 23 centigrade is hot for me, I like the long days awakening to the glimpse of sun through the curtains, and the day somehow seems inspiring. As Summer draws to a close and Autumn settles in it seems to reinforce the notion of dark and dreary. Autumn is the time when the leaves change from the lovely green to a dark withered green and eventually a brown. In England we change our clocks at the end of October and soon the day becomes shorter and the nights longer. I dislike leaving in the mornings when it is dark and returning home also in the dark. That darkness I think lasts for months, across the Christmas period and through until the end of March when we set the clocks back an hour and everything seems full of hope once more.